Buzzetti alternator rotor puller M18x1.0 left-handed thread. Required for working on the alternator and underlying parts as well as changing crankshafts and bearings. Suitable for alternator rotors on CPI engines, Chinese Minarelli derived 2-stroke engines and Minarelli AM engines amongst others. The puller is screwed into the rotor and pulls using a tension screw. Rotors that don`t come unstuck can be eased along with light hammer blows to the tension screw. 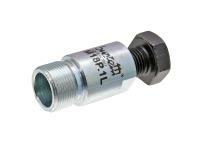 Warning: CPI, Keeway and Chinese Minarelli derived 2-strokes use a choice of M18x1.0 LH or M27x1.0 LH threads. Be sure to check the thread specification of the rotor before use.